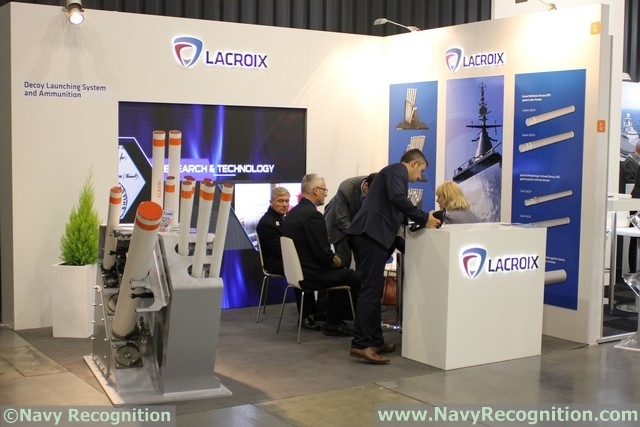 At the Balt Military Expo 2016 naval defense exposition currently underway in Gdansk, Poland, French company Lacroix is showcasing its SYLENA MK2 decoy launcher. It is a multiple decoy launcher designed to deploy three types of ammunitions: SEALEM, SEALIR and CANTO. 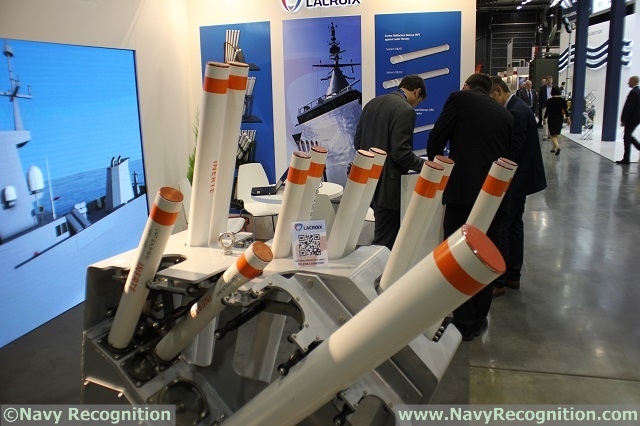 SYLENA MK2 decoy launcher showcased on Lacroix stand during Balt Military Expo 2016 in Gdansk, Poland. SEALEM is a corner reflector Radio-Frequency (RF) decoy: It is design to match the ship's RF signature to challenge advanced missile's CCM. It is able to defeat generic and emerging threats as well as multi-missile salvoes. SEALIR is a morphologic Infra Red (IR) spectral decoy: It is design to match the ship's IR signature. It is capable of defeating the full range of traditional and modern IR seekers as well as the latest generation of imaging IR seekers. CANTO (by DCNS) is an all in one broadband active acoustic emitter acting both as a jammer for dilution effect and as a false target generator for confusion effect. The extremely confused tactical picture forces the attacking torpedo(es) to waste time and energy finding the real target. Navy Recognition learned recently during DIMDEX 2016 that the Egyptian Navy became the first customer of the SYLENA MK2, when it selected the system for its future Gowind corvettes. Talking to Navy Recognition, a Lacroix representative at the show explained that the SYLENA MK2 is the lightest decoy launcher of its kind available on the market today. It is very compact as well. In Poland, Lacroix has the so called "3 + 3" program in sight. The French company is hopeful to fit its decoy launcher aboard the future Miecznik defense coastal vessels and the Czapla offshore patrol vessels (PGZ has been selected as prime contractor for both classes). The system could also be selected as part of the Orkan modernization program. The Lacroix representative stressed that the SYLENA family is platform agnostic, explaining that it has already been fitted on various designs such as ST Marine's OPVs built in Singapore. Another variant is available: the SYLENA MK2 IN: The launcher is then integrated into the structure of the ship and the top of the launcher is flush with the deck to maximise stealth.